Our East Boynton Dental team makes you feel comfortable about your East Boynton Dental experience and provides the highest quality care. East Boynton Dental, takes great pride introducing a new member to “our team”. Her name is Erica Peiwen Yen, and she is our new Hygienist. 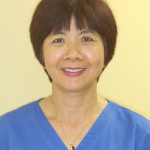 Born in Taiwan, she came to the US in 1986 and graduated in 2001 with an Associates of Science degree in Dental Hygiene with High Honors from Bristol Community College. My passion is to serve patients and develop lasting relationships by promoting health and wellness that inspires them to have healthier teeth, body, mind and spirit. Alicia has been at East Boynton Dental since 1999. She assists Dr. Indictor with everything from dental restorations to major surgeries. Prior to moving to the United States and joining our Boynton dental team, Alicia was a practicing dentist in her native Honduras. Patients often describe her as having a quiet, dignified, reassuring manner. Marcie joined the East Boynton Dental team as a dental assistant eight years ago. A graduate of Palm Beach State, she is a certified dental assistant and now holds the position of Office Manager. She helps schedule appointments, works with insurance companies, and answers questions. If you need help with anything, ask Marcie. Patients describe her as friendly, personable, and accommodating. Ronda joined our Team in February 2014 as Office Manager. She has worked in the dental field for over 30 years in various capacities, beginning as a dental assistant in NY. Her last position was working for an Orthodontist for 10 years in NJ. Ronda will be happy to help with any questions related to insurance, billing, or scheduling issues. Patients describe her as compassionate, very friendly, and sincere. Adriana joined our East Boynton dental team as a Registered Dental Hygienist in 2009. She holds a degree in Dental Hygiene from Palm Beach State. She makes her patients’ dental visits pleasant while educating them on their individual dental care needs. Patients describe her as gentle and caring.